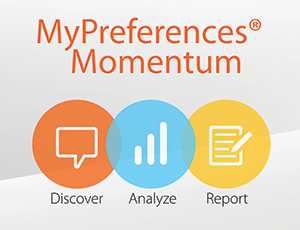 When we launched MyPreferences Momentum just six months ago, we knew we were addressing a significant need in the marketplace. Designed to help internal stakeholders build a business case and develop a plan for preference management implementation, Momentum projects fill the strategic gaps that often impede loyalty and compliance programming. We assumed this would be appealing to a number of CMOs and customer experience specialists who were bogged down in logistics and internal approvals. Today, I'm pleased to report that we were right. In fact, the response to Momentum has exceeded our expectations. We’ve executed Momentum projects for leading companies in commercial air travel, insurance, financial services, agricultural manufacturing, payment processing and more. Onsite Evaluation and Assessment. PossibleNOW's multi-disciplinary team includes experts in information technology, marketing, user adoption and regulatory compliance. They conduct a series of interviews with key stakeholders in your organization to uncover and understand the need for preference management in each functional area. Functional Area Evaluation and Documentation. Building on the initial onsite evaluation, our experts continue in their areas of focus to document existing requirements, review secondary discovery information and apply best practices and knowledge gleaned from preference center implementations at similar organizations. They'll create a strategic roadmap that outlines the project plan, scope, gap analysis and considerations for an enterprise-wide preference management implementation. Needs Assessment Report. PossibleNOW's team presents the results of the Needs Assessment to a cross-functional team of internal stakeholders and decision-makers. The report includes an understanding of the near term steps necessary to successfully implement a preference management solution, the steps to create a preference center and what must be done to integrate with desired systems and touch points. Companies receive a high level competitive industry analysis to see where they align with their peers in terms of preference management. The report outlines the strategic steps to holistically implement preference management across the enterprise. We're excited to grow our Momentum consulting practice in 2015 and help more and more companies speed the distance from planning to execution. To learn more about Momentum and how it might make a difference for your company, click here or give us a call at (800) 585-4888.